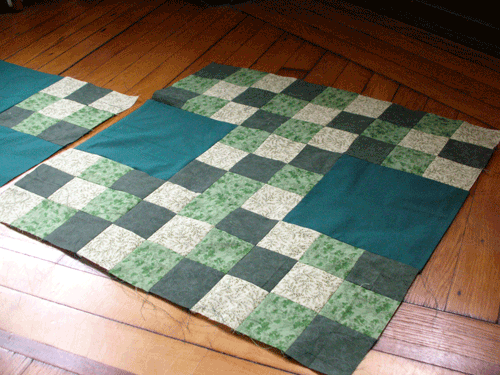 This is the Nine-Patch Lattice Quilt from Oh, Fransson!, Elizabeth Hartman’s quilting blog. I stumbled across her tutorial on how to make crazy nine-patch blocks a year or so ago and thought it was genius. So when I got the urge to try my hand at quilting something that actually had a pattern, I thought of the tutorial, visited her blog, and found the Nine-Patch quilt. The practice blocks I did were mock-ups for this project. I didn’t end up going for crazy blocks, because I preferred the lattice effect of symmetrical squares. 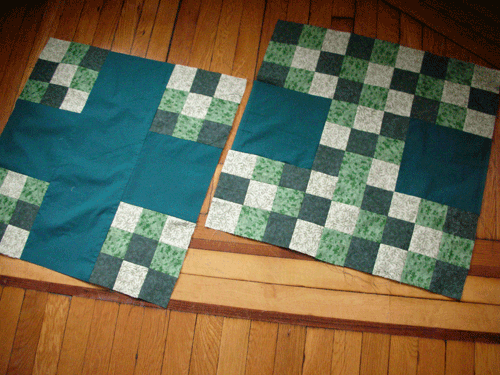 I strip-pieced the blocks, which made everything much faster and easier, and aside from learning that I can’t sew a scant 1/4″ seam without a guide of some kind (and even then, I sometimes manage to sew a slightly wider seam, just enough to throw things of a teeny bit overall), it went very smoothly. 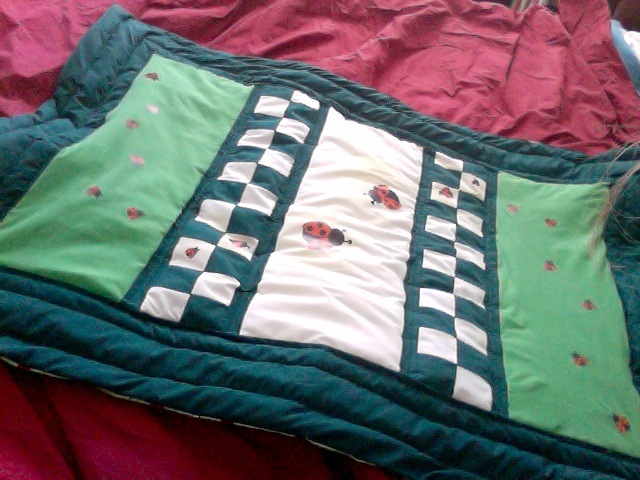 I used nine fat quarters I’d picked up at a Joann Fabrics to use together. Originally I was going to use the green sheet I used in the test pillow squares as sashing, but something about it didn’t quite look right to me. So when I went down to Brooklyn General to pick up a 6×24″ quilting ruler, I brought along one of the squares, and laid it against some of the fabrics they had there. This is Kona Cotton in Navy (if I recall the color correctly: a dark blue, in any case) and I really like the way it sets off the greens. 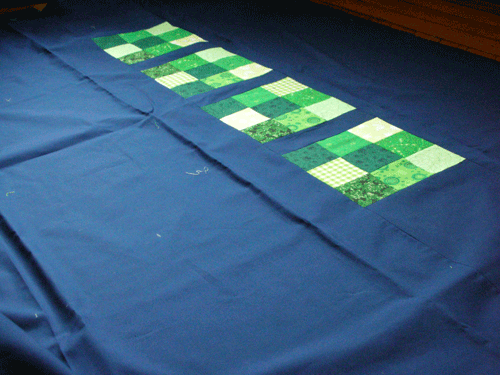 The little squares remind me of stained glass windows, glowing in the darker wall of blue fabric. When my cousins had their first daughter about four years ago, I asked if they would rather have a knitted baby blanket, or a quilt, and they picked the quilt. So I pulled out a baby quilt that my grandmother had helped me start making when I was a teenager, (which had fallen into the black hole of unfinished projects that is my closet), sewed it all together and appliqued on little ducks, and sent it off. The ladybugs are iron-on instead of applique: the idea of sewing on all the little ladybug dots by hand made my head hurt just a little bit. The pattern is the same one my grandmother always used, which is to say none whatsoever, which made for some fun math and re-jiggering so that the two quilts hopefully sort of match. It’s not perfect, but I think it turned out okay. And it got me started on other projects. 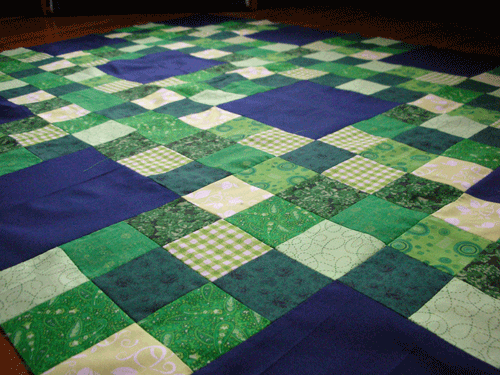 Getting into quilting is largely what made me start this blogging thing up again. And that’s largely because of quilting blogs I was reading that made me think “That’s gorgeous!” and “Hey, maybe I could eventually learn to do something like that!” Besides, it’s not as if I have a dozen knitting and spinning WiPs. I’ve only got, say, eleven or so of those. 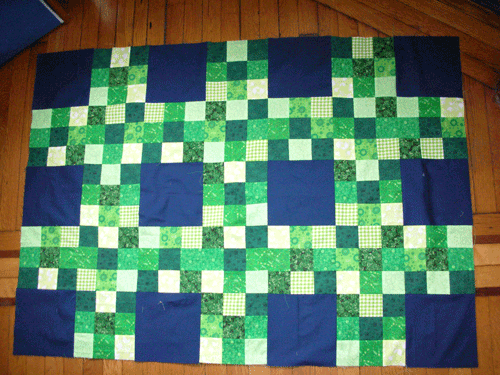 The first project I really wanted to try was the Ninepatch Lattice Quilt. Elizabeth Hartman’s blog, Oh, Fransson! is a source of fabulous information and inspiration. Her patterns are clear and easy to follow, and I love the way she thinks. Of course, I didn’t trust myself to do anything right the first time around, so I made a set of practice nine-patch blocks, and then, when they weren’t disastrous, sewed them together into squares that I’ll probably use as the front and back of a pillow. The print fabrics are fat quarters I picked up at a Joann Fabrics sometime when I was in Connecticut or Indiana, and the green is from a sheet I picked up at a thrift store in Atlanta for pretty much exactly this kind of project. I don’t think they match perfectly, but for a test swatch, I think it came out okay. Six years ago, while I was in college, I started a knitting blog. I kept it up for about a month and all of four entries, only two of which had photographs. Let’s see if I can’t do better than that this time. Now that it’s 2012, I’m a graduate student in medieval European history, and will be for about another five years. In the intervening time I’ve picked up spinning (a few years ago) and quilting (a few weeks ago). Sometimes I miss having a full-time job, especially when I have paper deadlines hanging over my head, but for the most part I’m pleased to be studying things I love. Links, but still no pictures. 1) I am a better knitter than I think I am. I am a better knitter than I was a few months ago. My goal was one pair of socks: I finished them in a week. 2) I am so bad at knitting only one thing at a time. I always have at least three things going on at once. 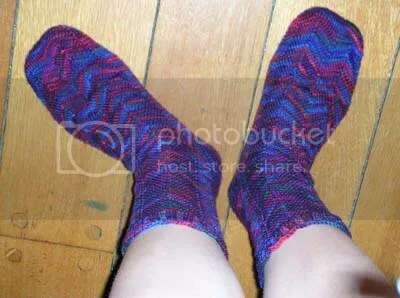 These two dovetail to mean that when I knit only on one project – my Olympic socks – I finished them insanely fast. Seven days, Saturday to Saturday, and I was done. I kinda stared at myself and wondered what happened, because I’ve never knit something that fast before. How’d I pick my sock pattern? I started off thinking I’d do Aran Braid socks, and could not get gauge for the life of me. I knit a pair of Broadripple socks instead — they’re a lace pattern, but still doable, and not too terribly difficult, right? I’d started a pair of Broadripples last fall and could not figure out how to make the k2tog and ssk decreases look different: I was twisting all of my stitches and didn’t realise it. This time around it made sense right away, and I didn’t get any pesky laddering next to each yarn over. I need to give myself more credit. Of course, I felt like I had to keep knitting during the Olympics, so in the past few weeks I finished my bottom-up striped raglan sweater and started a pair of socks for my dad. Since getting home for spring break, I’ve also made two stuffed bears for Bay Window Bears. I started a pair of Norwegian Stockings from Nancy Bush’s Folk Socks, and am working on another stuffed bear. I’ve got to finish my dad’s ribbed socks (the most boring things in the entire world, I swear) and only an insane effort of will is keeping me from casting on for the Print O’ The Wave Stole with my new determination. I can knit it, so why not start now? But I’m going to finish something else first. Author AlisaPosted on March 12, 2006 March 15, 2012 Categories KnittingLeave a comment on Links, but still no pictures. 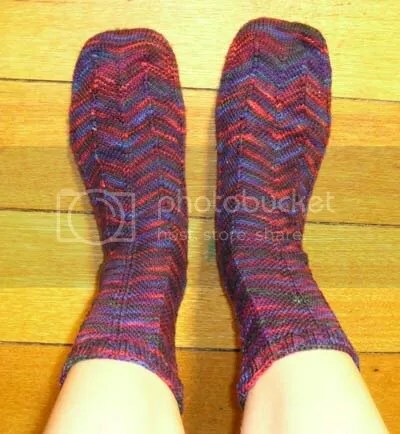 These are the second socks I’ve ever knit: Jaywalkers. I finished them last weekend, and just wove in the ends tonight. They’re for my sister, whose feet are a size bigger than mine, so they look floppy and loose on my feet. The color isn’t very true in either of these: they’re closer to the first one in general, but the red is brighter, closer to the second one, though neither is quite right. Teach me to take pictures in dorm lighting, eh? The pattern is great: I could see how it was meant to work, and I was able to fiddle with it to make sure it’d fit sis’s feet just right. The patterning keeps it from sagging down your legs when you’re wearing them, and the only thing I’d change about them would be knitting the ribbing at the top on a smaller size needle: as it is it’s mostly decorative, not tight enough to make a difference. Thankfully they don’t need it to stay up!